Suzuki Motorcycles India Limited wants a bigger share of the 150cc motorcycle segment, and what better way to get that than by launching a stylish and sporty bike? Say hello to the Suzuki Gixxer 150cc motorcycle. 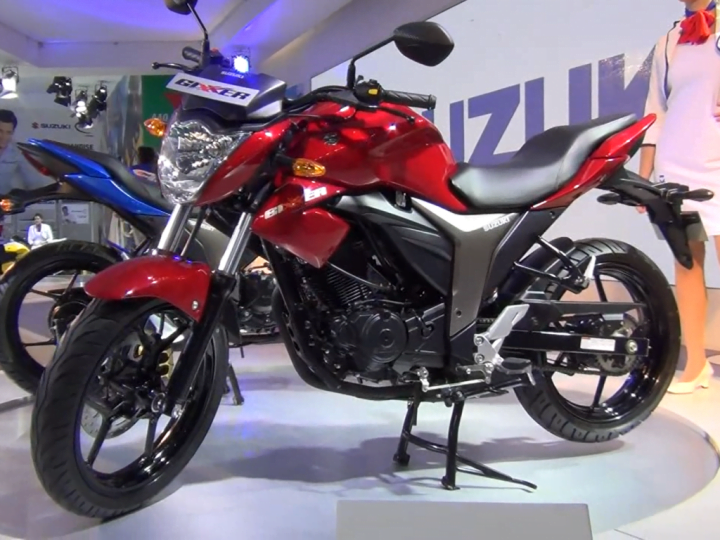 Suzuki’s previous offering in the segment, the Suzuki GS150R will continue to sell alongside the Gixxer, being the more conservative choice. The company has revealed the bike at the 2014 Indian Auto Expo and below you can find all the details that have been released till now. Suzuki Gixxer Specifications have been leaked before Indonesia launch of the motorcycle. You can check out more details here- Suzuki Gixxer Specifications Leaked. We had earlier stated that the Suzuki Gixxer 150cc motorcycle will be launched in India in July 2014. But according to a new report on Indian Autos Blog.com, the bike will be launched in India in August 2014. We will keep you posted on the latest developments related to the bike. Keep following Car Blog India. To be announced at launch, in August 2014. We expect it to be priced at around Rs. 70,000. We will watch the developments on the Suzuki Gixxer 150cc motorcycle and will keep you updated, don’t forget to subscribe to our newsletter for latest updates. The Suzuki Gixxer 150cc will be the flagship bike of the company in the 150cc segment and thus is a bit more stylish, borrowing a lot of cues from it’s more powerful siblings. In all it is a fairly good looking bike, styling cues for the Suzuki Gixxer have been borrowed from bikes like the now discontinued SV650, and the B-King. At front you get a very minimal fascia, the headlamp is a slightly redesigned version of the one found on the GS150R. Move to the side and you notice the ‘Gixxer’ branding on the tank extension, the Suzuki logo on the tank and the company’s name on a grey plastic element, the bike is devoid of any other graphics. The short and stubby exhaust gives the bike a very sporty look though the chrome-plated end may not be to everybody’s taste, the exhaust design was seen for the first time on Suzuki bikes with the launch of the B-King. The alloy wheel design is pretty attractive, that combined with the chunky tryes give the bike a purposeful stance. The stacked seating is stylish, we cannot say if it comfortable till we get to ride the bike though. Move towards the rear and you will notice the exposed-drive chain, the nicely integrated grab handles and the minimalist brake light. The instrument cluster is all digital, though a bit small for our liking. The handlebar and controls on it feel pretty well built, but these are all first impressions. The wide tank looks sporty and the knee recesses on it should aid in better control for the rider. The rider posture is a bit aggressive, with a low handlebar and slightly rear-set foot-pegs which would appeal to many buyers in this category. Check out more photos of the bike below. Suzuki will reveal more details about the Suzuki Gixxer 150cc motorcycle closer to the launch in July 2014, but here’s what we know. The bike will be powered by a 155cc, single-cylinder , air-cooled engine. Performance or economy features of the same have not been provided till now. Suzuki does mention though that the bike will be powerful and economical thanks to their proprietary SEP technology, SEP stands for ‘Suzuki Eco Performance’. There is no info about the transmission on the bike, but we expect that Suzuki will offer a 5-speed unit. Suspension duties are handles by telescopic forks at the front and mono shock at the rear, braking is handled by a disc at front and a drum at the rear. Power is fed via a chain to the rear tyre. The bike will be positioned as a sporty offering and will compete against the likes of the Yamah FZ -S, the Honda CB Trigger and the Honda CB Unicorn Dazzler. Let us know your thoughts on the bike in the comments section below.